William Henry (Harry) 'Shanta' Morgan was 32 years old when he kicked five goals on debut for Carlton against St Kilda in 1921. A highly-decorated footballer from WA who had plied his trade on both sides of the continent by then, Harry was skilful, a safe mark and a long, accurate kick with either foot. He could genuinely play in any position, however in ten matches for the Blues in the twilight of his career, he was used exclusively at full-forward, and scored a respectable average of 2.5 goals per game. Born at Harris Park in Parramatta, New South Wales in 1889, Morgan began his senior football career with Subiaco as a defender, before his excellent foot skills and creativity demanded a more responsible role. His move to the centre for the Maroons was a big factor in Subiaco’s first two WAFL Premiership wins in 1912-13. Having gained that success, Harry was lured east by South Melbourne in 1914, and played in his third consecutive Grand Final when the Bloods lost to Carlton by 6 points in that season’s VFL flag decider. During his time at the Lake Oval, Harry shaped himself into a dangerous forward whose high-marking prowess allowed him to pinch-hit in either of the key forward posts. He was a reliable set shot for goal, and an accurate snap kick off both sides of his body – skills well used when he topped South Melbourne’s goal-kicking in 1915 with 48 goals, and 1917 with 23 majors. 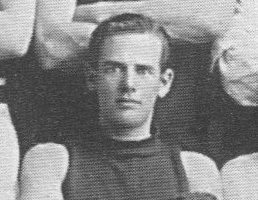 Although South went into recess in 1916 due to World War 1, Morgan had played 60 VFL games and booted exactly 100 goals by 1918. In 1919, Harry left the Lake Oval to play in the VFA with Footscray, and his charmed run of success continued when the Tricolours beat North Melbourne by 22 points in that season’s Grand Final. He went back to Western Australia for one last season with Subiaco in 1920, and the following year headed east again to join the Navy Blues. Remarkably, Harry didn’t play in a losing side for Carlton, although there were consecutive draws in his ten matches; the first against Fitzroy, and the second against his former mates at South Melbourne, in rounds four and five respectively. While no doubt some would have questioned the decision to recruit such a veteran, Morgan proved his worth when he kicked five majors on debut for Carlton against St Kilda, and another five a fortnight later in the draw against South Melbourne. By round 14, Harry had racked up 25 goals for the Blues, but after not scoring against Essendon at Princes Park in round 15, decided that as far as VFL football went, he didn’t want to carry on. Even so, he wasn’t quite finished with the game. Nearly a year after leaving Princes Park, Harry bobbed up at SAFL club West Adelaide. In another five games for Wests, he kicked 12 goals to finish off a long, varied and successful football journey. Interestingly, this Harry Morgan was actually the second senior player at Carlton to carry the same name. The first; Henry Huston Morgan, appeared in 11 matches for the Blues in 1897. 'Shanta' Morgan died in Tasmania on 23rd May, 1965. He was buried in the Melbourne General Cemetery alongside his wife, who passed away in 1961. A very talented footballer, Harry Morgan could be described as a man who had been everywhere. 1. Picture courtesy of FullPointsFooty. Contributors to this page: blueycarlton , molsey , PatsFitztrick , WillowBlue , Bombasheldon , tmd1 , p(12)terg , true_blue24 , Jarusa and admin . Page last modified on Thursday 21 of January, 2016 10:47:17 AEDT by blueycarlton. 1995 - Justin Madden Interview (05/07/95). pg 3 of 3.